he aim of Martin Frobisher's first voyage (1576) was to find a Northwest Passage to Cathay, but after reports of finding gold, interest shifted to mining. During the second voyage (1577), after which Britain laid claim to "Meta Incognita" (Baffin Island), a mine was opened near southeast Baffin Island, and 158 tons of ore were shipped to Bristol and London. This first mine, and six others nearby, were worked in the last voyage (1578), which resulted in 1136 tons of ore being sent to Dartford. One ship carrying another 110 tons was wrecked and beached in Smerwick Harbour, Ireland. Furnaces in London produced high-grade assays, but they were abandoned in 1579. Later that same year the newly constructed Dartford works extracted a little silver, but the enterprise soon collapsed. Although Michael Lok, its creator, went to jail, Frobisher and his captains became famous. Frobisher's ore consisted of metamorphosed mafic and ultramafic rocks characterized by hornblende, unusual textures, an uncommon chemical composition (high iron and aluminum, significant chromium and nickel), and two ages (1470 and 1840 million years). The percentage of gold was phenomenally low, commonly approaching the abundance in the earth's crust. 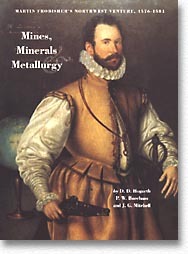 The spectacular grade reported in 1577-78 may have been due to incompetent assayers or gold and silver added deliberately to the furnace charge. By D.D. Hogarth, P.W. Boreham and J.G. Mitchell. 17.8 x 24 cm, 200 pp. Make cheque or money order payable to the Canadian Museum of Civilization.